Robert’s Russian (address and info) Hollywood For over 20 years, Robert’s Russian in Hollywood has received plenty of praise for their Russian vareniki dumplings (covered in caramelized onions), and their pillowy, thin-doughed Ukrainian pelmeni dumplings. 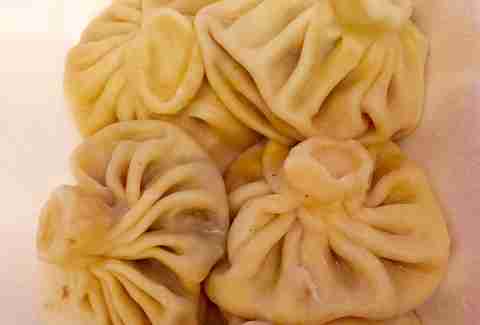 Both are incredibly good, but it’s the restaurant’s Georgian-style khinkali dumplings, dusted with black pepper, that steal the show. The piping hot delights are like Eastern European soup dumplings, but the dough takes on more than one form -- soft and noodle-like where the soup has touched, and chewy and light where it’s soup-free. Biting into one of these beef-filled parcels is like warming your soul from the inside out. Pro tip: the thick knot on top is meant to be pierced with your fork for easier slurping, not for eating. Myung In Dumplings (address and info) Koreatown Off Olympic in Los Angeles’ thriving Koreatown, Myung In Dumplings serves a variety of classic Asian dumplings. You could easily fill up on the steamed pork, shrimp, and xiao long bao-style dumplings, but the king here is the, uh, Steam King dumpling with pork and kimchi. 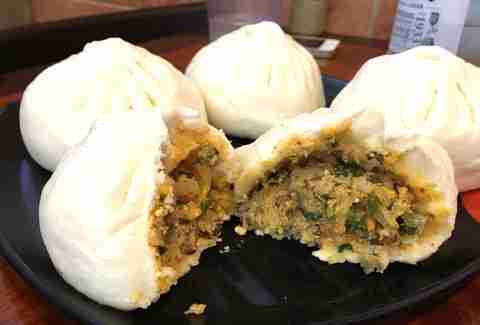 The giant, doughy rounds (also called wang mandu) are a take on Chinese baozi, or bun. The bread-like pockets are filled with housemade kimchi and pork, which, once steamed, lend to a perfect ratio of fluffy and juicy with a hint of tang. And get multiple orders: one will not be enough. Ruen Pair (address and info) Thai Town Ruen Pair in Hollywood’s Thai Town serves some of the most authentic Thai food outside of Asia. 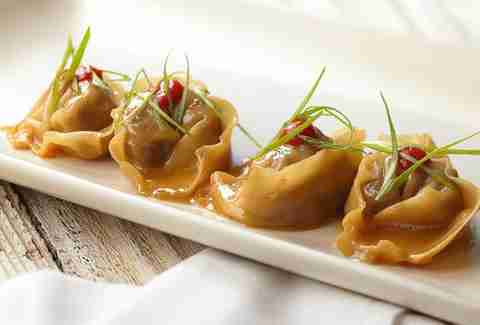 Sweet, spicy, crunchy, salty, and sour describe many of the dishes on Ruen Pair’s menu, including its prized wontons. The fried wontons are made with golden fried skin that’s not oily but instead crunchy and full of flavor is wrapped around marinated pork to form pudgy, chewy centers, with pointed edges, perfect for dipping. The long-standing LA favorite also serves another Thai classic, a whole shrimp wrapped in a wonton skin that is then fried -- Thailand’s crispier version of pigs in a blanket. Get an order of each to ensure you’re fully satiated. Tar & Roses (address and info) Santa Monica At Tar & Roses in Santa Monica, Chef Andrew Kirschner’s oxtail dumplings are an elevated take on the Chinese wonton. Beautiful wheat pockets filled with slightly fatty oxtail meat are infused with onions, garlic, and veal stock to form the perfect one-bite appetizer. But wait: there’s more! They’re topped with san bai su; a Japanese sauce made of Mirin, soy sauce, and rice wine vinegar, plus chili sauce and sliced green onions which creates a mouth-watering flavor that will have you hailing down your waiter for a second order (or third) before you’ve finished your first. Pine and Crane (address and info) Silverlake In Taiwan, light, airy wontons are just as common as their beloved minced pork over rice. And shrimp is always a popular filling due to the country’s island locale. In Silverlake, Pine & Crane mimics the authentic taste and feel of the Taiwanese dumpling experience with their spicy shrimp wontons. Sumptuous heaps of wrinkly-skinned packets swim effortlessly in a heaping bowl of the restaurant’s house chili oil. The wontons are topped with green onions and cilantro creating a powerhouse of spicy shrimp goodness you’ll want to devour immediately. 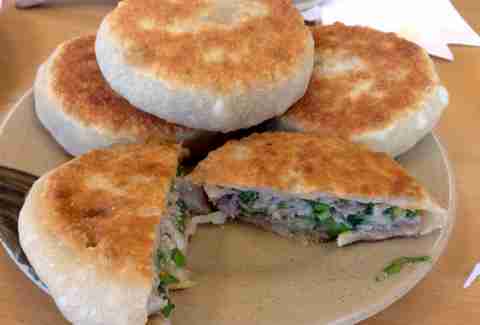 Beijing Pie House (address and info) Monterey Park Xian bing, aka Beijing pies are like pan-fried hamburgers, minus the cheese. What makes these Sichuan treats so special is in the dough, which is similar to the mixture used for flaky scallion pancakes. To make the pies, the dough is oiled and left to rest, then filled with ground beef, lamb, or chicken and green onions and shaped, creating a massive hand-held pie that is then pan-fried to crispy perfection. Myung Dong Kyoja (address and info) Koreatown Situated on the corner of Wilshire and Harvard, the sparse dining room of Myung Dong Kyjoa is one of Los Angeles’ best spots for Korean home cooking and is mostly known for its boiled pork dumplings, or mulmandu, which are served in a light broth, and rounded out with glass noodles and ground chicken to form the restaurant’s take on chicken noodle soup. The beauty of these plump and sturdy dumplings is the mixture of vegetables seasoned with ginger, soy sauce, and garlic that are tucked inside a wheat wrapper bathing in a salty chicken broth. As you bite into the dumpling the juicy meat and delicate wrapper melt into the broth and perfection is created. Bless. 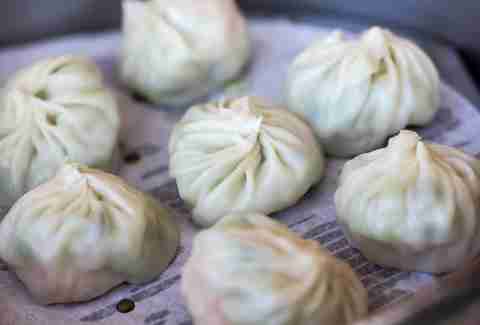 Din Tai Fung (address and info) Arcadia Xiao long bao, aka soup dumplings, are made by filling wispy dough with juicy meat and savory soup. Be sure to follow the rules of soup dumpling etiquette by biting a tiny hole in the dumpling and sucking out the soup before eating the dumpling, otherwise you risk total embarrassment and boiling broth spilling all over your table. 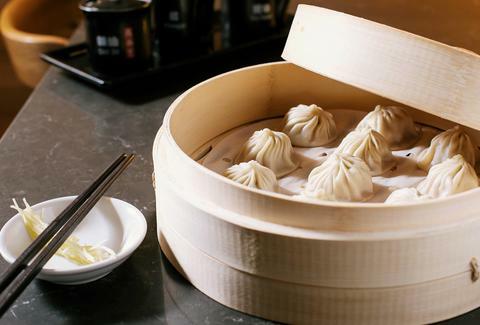 Din Tai Fung, the Taiwanese institution famous for its xiao long bao, has three restaurants in Los Angeles, and at the Arcadia locations, the soup is thick and full of flavor, the dough is light without being sticky, and the fillings are hefty without weighing down the dough. The result is a tender bite of heaven filled with a porky-rich broth. The good news is an order comes with eight. Sharing not required. Birch (address and info) Hollywood Technically not a dumpling, but still a wondrous filling-rich packet, is the Mediterranean treat, Baklava. Most commonly found in dessert form, Baklava summons the senses with sweet layers of chopped nuts and butter that ooze out when you take a bite. In the case of Birch, the restaurant takes paper-thin phyllo dough and wraps it around heaps of stewed rabbit, dates, white beans, and pistachios. Dim Sum Express (address and info) Monterey Park In Monterey Park, Dim Sum Express, a small shack on Garfield Ave, serves some of the best har gow in Los Angeles. Bursting with succulent shrimp, bits of bamboo shoots and a touch of sesame oil, these steamed, mochi-like dumplings deliver a hint of sweetness married with an oil-kissed chewiness that’s beyond words. 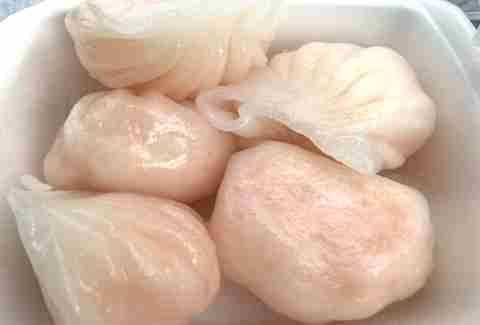 Oh, and these har gow are not only big on flavor; their sheer size makes this bite big enough for two.